Today after an annoying problem with my PC I had to format it and reinstall everything. Of course I made backup of all my files but, as always it seems that I lost something. I use Visual Boy Advance, specifically a modification of it called VisualLink. I saved my files regularly using the virtual Flash ROM the emulator provides to save "in game". But now, after everything is done, all my files have been moved back, I was testing it and the save file is not recognized anymore. It doesn't show a corrupted message, it simply would not recognize the saved data. I'm not sure how to fix or workaround this. The saved data was done after a lot of gaming time and I really don't want to have to do it again. I appreciate your time. 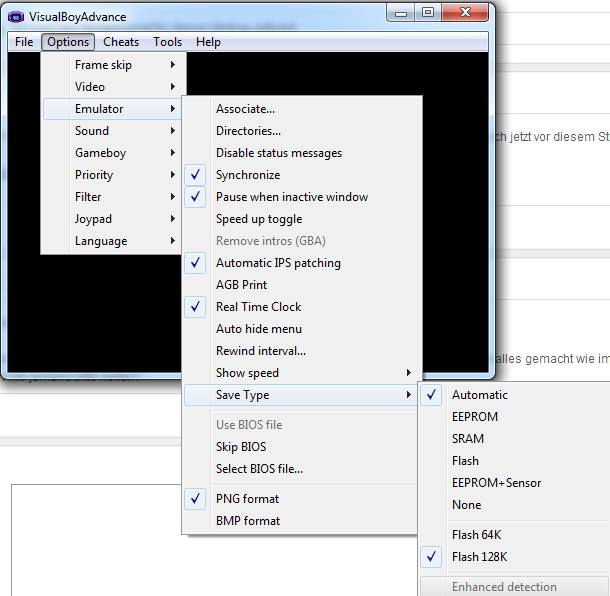 Check the emulator settings. You most likely have a different save type, you should try to change that and reload the game. If you don't know your old savetype, you'll need to try. Not the answer you're looking for? Browse other questions tagged emulation game-boy-advance or ask your own question. Is the light bulb in the Game Boy Advance SP replaceable? Is the Game Boy Advance SP charger dual voltage? Can two players play a multiplayer game for Game Boy Advance using only one cartridge? What are the Game Boy Advance (GBA) Game Pak ROM cartridge physical dimensions (length x width x height)? How to convert a MyBoy save file to a No$GBA save file?